Ryan and I started talking about this idea at the 2015 Colorado Pen Show. Fast forward almost 2 years, and we came up with a plan combining my ideas with Ryan's creativity and amazing craftsmanship. Beyond making a Fountain Pen Day pen, we wanted to create a something that would contribute to a great cause beyond our community. The pen will be based on The Legend by Ryan Krusac. Made of Gaboon Ebony wood, you can order either the L14 or L16. There will be a total of 60 made between both sizes. It will have the Fountain Pen Day logo on the cap and Ryan's logo on the opposing side with the limited edition number below that and filled with crushed turquoise from the Kingman mine in Arizona. 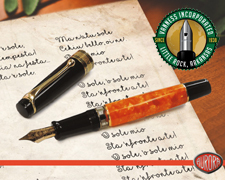 The section is made of ebonite and will house a #6 Jowo steel nib engraved with the Fountain Pen Day logo as well. There is an upgrade option for an 18K nib though it cannot be engraved. Numbers 2 - 60 will be available to the public, and you will be able to request the number and pen you want. We will have a running list of numbers available as we move along. Ryan will be able to produce 5 pens per month and they will be filled in the order of requests. That means if you are the 1st person to order and you want an L16 with #16, yours will be produced first. The #1 pen will be a extra special edition with turquoise inlays on the top and bottom of the pen as well. This pen will be auctioned off with 100% of the proceeds going towards the endowment. The auction will go live once the pen is ready and launched on Shawn's site as he has run these types of auctions before. Prices will be $425 for the L-14 and $475 for the L-16. The next step was choosing a cause and Shawn Newton's Scholarship fund was the perfect direction to go. Shawn has been raising money to hand out scholarships for the past 5 years. He has raised and given away over $26,000. His next step was to fund an endowment and the minimum to do so is $10,000. Ryan and I have figured out what it will take to fund a full endowment with this project and are excited to see it happen in record time. While at the San Francisco Pen Show 2017 Mark Dwight of Rickshaw Bagworks approached us about making a pen sleeve to match the Fountain Pen Day Legend. Mark had a design and color scheme that compliments the pen beautifully. A black pen sleeve with super soft interior that is turquoise in color and the Fountain Pen Day logo on the outside done in turquoise as well. Below is a picture of Shawn Newton receiving the 1st check for $3,075 going towards the Newton Pens Scholarship Endowment at the 2017 Colorado Pen Show.